IN-FLIGHT200 Models: one limited edition collectable, die-cast metal airliner model in a 1/200th scale of a Boeing B737-217/Advanced in the ZIP Airlines Last Jellybean Blue Color Scheme. Airframe Registration C-GJCP. This model is constructed of die-cast metal with some plastic parts. This product is available beginning in May 2010. IN-FLIGHT200 Models: one limited edition collectable, die-cast metal airliner model in a 1/200th scale of a Boeing B737-217/Advanced in the ZIP Airlines Last Jellybean Fuchsia Color Scheme. Airframe Registration C-GCPP. This model is constructed of die-cast metal with some plastic parts. This product is available beginning in April 2010. JET-X Models: one limited edition collectible, die cast airliner model, in a 1/400th scale of a McDonnell Douglas MD-11F in the World Airways Old 1990’s Colors Scheme. Exclusive JET-X Club Members Release. Airframe Registration N275WA. The model is constructed of metal with some plastic parts. This product was released in June, 2001. 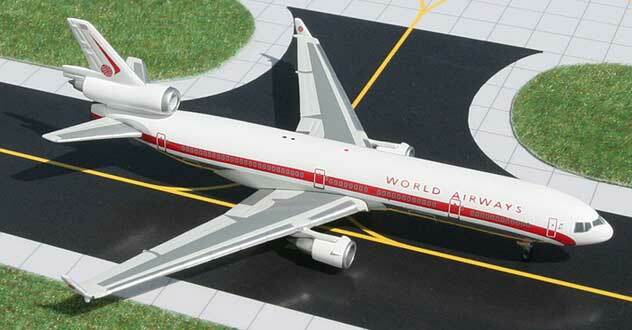 JET-X Models: one limited edition collectible, die cast airliner model, in a 1/400th scale of a McDonnell Douglas MD-11F in the World Airways Old 1990’s Colors Scheme. Airframe Registration N274WA. The model is constructed of metal with some plastic parts. This product was released in May, 2001. Gemini Jets Models: one limited edition collectible, die cast airliner model, in a 1/400th scale of a McDonnell Douglas MD-11 in the World Airways 1970’S Retro Colors Scheme. Airframe Registration N803DE. The model is constructed of metal with some plastic parts. This product was released in January, 2006. Gemini Jets Models: one limited edition collectible, die cast airliner model, in a 1/400th scale of a Saab SF-340 in the WestJet Airlines Current Color Scheme. Airframe Registration C-GPCF. The model is constructed of metal with some plastic parts. This product was released in December, 2018. 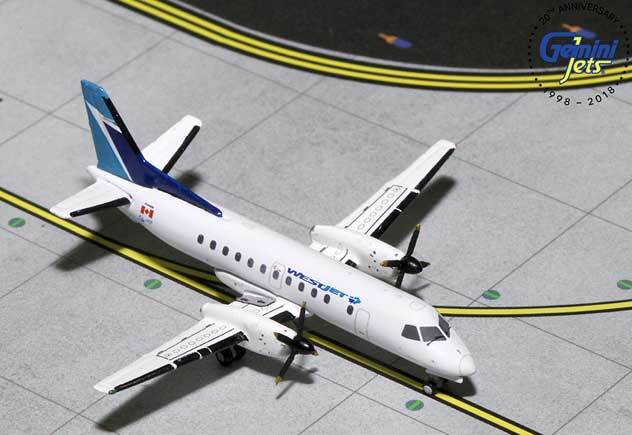 Gemini200 Models: one limited edition collectible, fully assembled, and highly detailed die cast airliner model, in a 1/200th scale of a Saab S-340B in the WestJet Airlines Current (WestJet Link – Pacific Coastal Airlines) 2019’s Colors Scheme. Airframe Registration C-GPCF. The model is constructed of die-cast metal with some plastic parts. This is a collectable model, not suitable for children under the age of 14 years. This product was first released in March, 2019. Gemini Jets Models: one limited edition collectible, fully assembled, and highly detailed die cast airliner model, in a 1/400th scale of a Boeing B787-9 Dreamliner in the WestJet Airlines NEW 2019’s Colors Scheme. Airframe Registration C-GUDH. The model is constructed of die-cast metal with some plastic parts. This is a collectable model, not suitable for children under the age of 14 years. This product was first released in April, 2019.